On my first morning in Kathmandu, I was greeted with a typical Nepali breakfast of vegetable and potato soup, roti (fried, unleavened bread), fruit salad, and the most delicious milk tea I'd ever (and perhaps will ever) taste. The Nepali breakfast is clearly very different from what I was use to in the US, but it was delicious, and filling, and easy to get use to. That looks awesomely good, and that’s quite the stylishly green dining set! Looks really delicious. I’m not a huge fan of cereals for breakfast, that looks much, much better! I wonder how they make the tea. I’ve lost the English habit of drinking it with milk, but I love chai teas, yet can’t recreate them properly at home! I was in Nepal for three months last year and milk tea was part of my breakfast nearly every morning. Ever go to Flavors Cafe in Boudha Stupa while you were in Kathmandu? That was one of my favorite hangouts. Food was good, too. Hi Deb, I spent a few nights in Boudha, but I don’t recall the names of the restaurants where I ate. Loved it there! Flavor’s cafe in Boudhanath is best of all the restaurants. I went there few times. Staffs are friendly and seem happy. Owner is good hearted guy. This is how I make my tea. First I boil milk and if you want you can add water. Let it boil and add sugar (amount? up to your own taste) then add lipton tea. I use two lipton tea bags for a cup of tea. Sometime I also add small piece of ginger and clove. Try it and see if you like it. 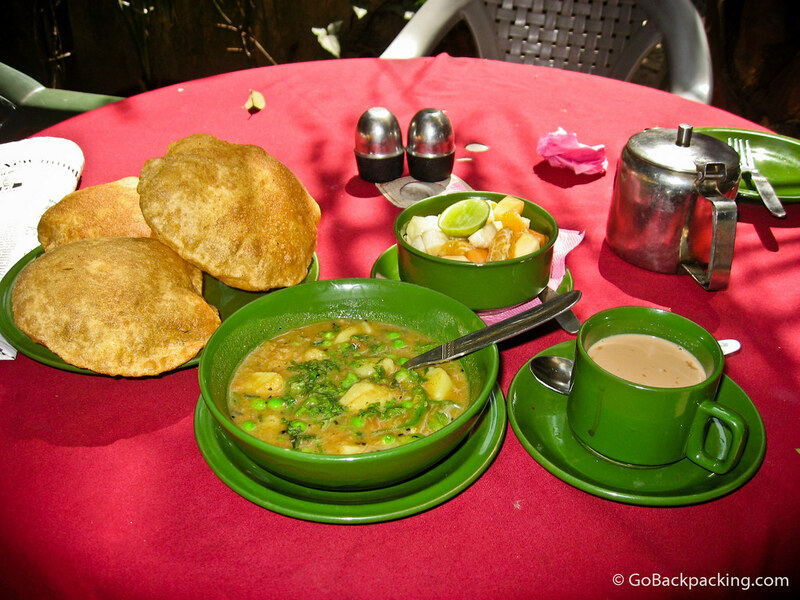 mmmmm, i miss nepali breakfasts. so flavorful and delicious. did you try tibetan bread? also good like roti. Now that you mention it Annie, I can’t recall eating Tibetan bread while I was in Nepal and northern India. I did try the infamous Tibetan butter tea in Chengdu, China. Best breakfast- love it, but it is actually Indian breakfast called puri sabji (tarkari). It is quite popular among Nepalese people too.